Blu-ray Disc Association partnered with Digital Media Management to build awareness of and conversation around the platform’s new Ultra HD 4K technology during the holiday shopping season to encourage sales. DMM identified 4 popular influencers in the tech space to create custom videos incorporating personal, movie-watching experiences and calling out the platform’s superior viewing quality. 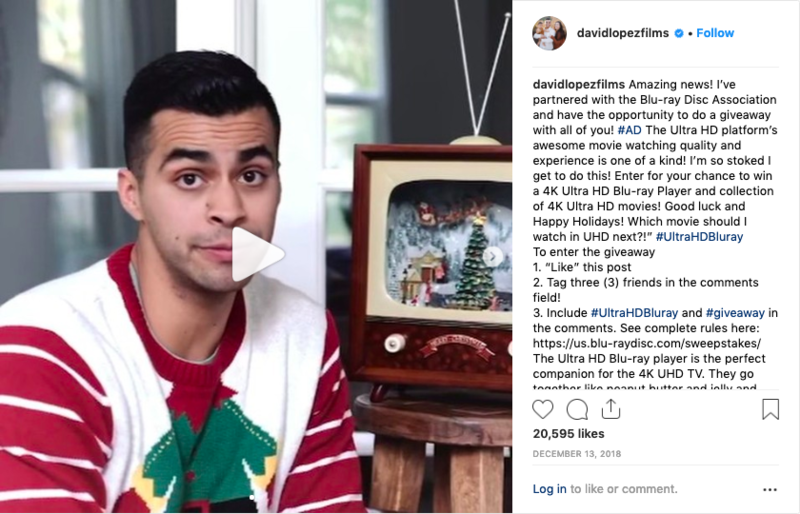 The videos were posted on their respective Instagram channels, along with a static image of a player and a collection of movies that were provided for a giveaway. The influencers’ followers were encouraged to like the post, tag 3 friends, and include #UltraHDBluRay in the comments for a chance to win the prize. Select BDA members (LG, Samsung, Philips, Sony, Disney, Fox, Warner Bros, Universal) received passive brand integration into the posts as prize sponsors. Their collective posts yielded more than 5.2M branded impressions and a combination of 1.2M likes, comments, and video views - a very impressive 22% engagement rate! The posts also drove 1,000 qualified entries into the sweepstakes. “One of my favorite things during the holidays is curling up on the couch with my pup and watching movies! With this technology, the experience is even that much more amazing. What’s your fav holiday movie?! I'm excited for this giveaway thanks to @Sony and Blu-ray Disc Association! ? " “#ad We got married in December, right during the prime holiday season…. As years went by and our family grew, we shared our love story with kids and our happiest memories continue to surface through their personal interpretations. Elia loves to dress up as Belle and watch her favorite movies on the 4K Ultra HD Blu-ray player. I must say, I am a little jealous we didn’t have this amazing technology 16 years ago. I can’t help but smile when she excitedly points out the smallest details I’ve never seen before even if I watched the said movie what feels like 100 times.